I smiled as I dug my crampons forcefully into the ice underfoot. I'd forgot how satisfying that sound and sensation were — maybe even better than crunching through fallen leaves in autumn. Certainly better than the sound of ordinary hiking boots on packed earth. Alaska's Matanuska Glacier was not my first glacier hike (last year, I climbed on the Franz Josef Glacier in New Zealand). But I'm now convinced that glacier trekking is like bungy jumping: it doesn't matter how many times you do it — it's still guaranteed to be amazing. The morning of this particular glacier hike could not have been more perfect. It was cool and clear — ideal for some outdoor exertion. A group of us set off early from Anchorage, bound for the Sutton area and the Matanuska Glacier. The 2-hour bus ride provided us with countless postcard-perfect mountain scenes, getting us pumped up for our adventure. We arrived at MICA Guides, paid a special access fee for the glacier (it's located on private land), and collected all the gear we'd need for the hike. This included boots, crampons, and helmets — all the safety essentials. Thankfully, this hike would not require rain gear; only sunglasses! Our large group split into 3 smaller ones, with 6 of us joining a guide named Alyssa. It's possible to hike out onto the glacier without a guide (and gear, for that matter), however I wouldn't recommend it. Alyssa not only knew the safest ways to cross the ever-shifting ice, but she was also knowledgable about everything from the history of the glacier to the region's geology. That, and she knew how to use an ice axe to carve out stairs for us. Me with Alyssa's ice axe. It's difficult to describe just how awesome glacier trekking is in words. It's nearly impossible to capture the wonder and awe that accompany crunching up alongside hundred-foot ice falls and crawling into blue-white ice caves. I simply can't put it all into sentences that would do the experience justice. So, instead, I'll show you. Hiking on a glacier is epic. There's no other word to describe it. If you haven't ever tried it, I highly recommend you consider it. The glaciers won't be around forever (in fact, some are receding so fast that you can't touch them anymore), so there's no better time than now. And, of course, glacier trekking wouldn't be possible without the key ingredient: ICE. Tons and tons of ice. As much as I loved trekking the Franz Josef Glacier last year, I think the Matanuska Glacier may take the award for “coolest glacier hike I've done.” The climb was slightly less challenging than in New Zealand, the weather was far better, and the ice formations (especially that huge ice fall!) were much more awe-inspiring. Two hours on the ice wasn't anywhere close to enough. 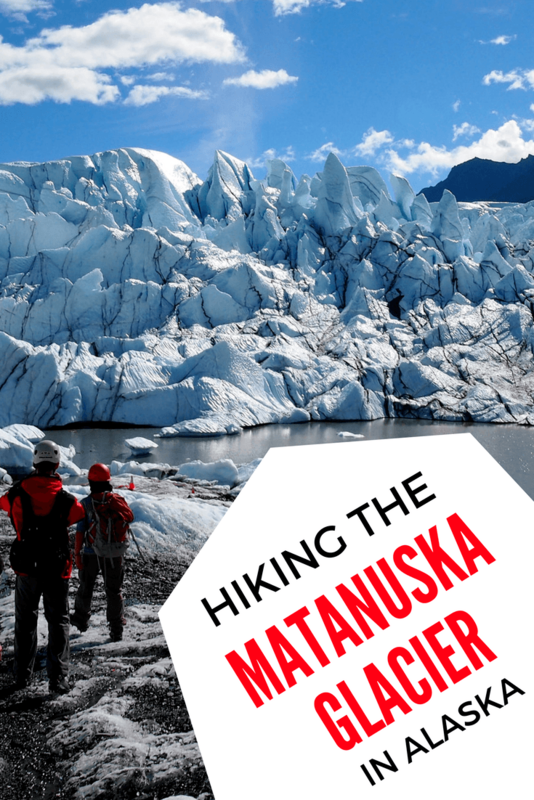 Hiking on the Matanuska Glacier is fairly accessible – you can book a tour from Anchorage, Alaska pretty easily. Which ice photo is your favorite? Does this post make YOU want to hike on a glacier? *Note: My trip to Alaska (including this awesome glacier trek) was sponsored by the Hilton Garden Inn Anchorage. All opinions, however, are entirely my own. We were there as well and loved the experience! Ooo, you guys went ice climbing! I’d love to do that! Awesome photos! Alaska is on my list! Not a big fan of the cold but the photos and views are gorgeous. Well, you know, it’s actually not that cold in the summer! 😉 And, even if it was, I think the views make it totally worth it! I have yet to walk on a glacier and long to visit Alaska but during the summer when not too cold which means I’ll have to take a summer off from Rangering. Yeah, I’m not sure how I’d enjoy Alaska in the winter… I mean, I’m used to the cold and have traveled to cold places in the winter before (Ottawa, Iceland…). But this particular activity is definitely best done in the summer! I’ve never been hiking with spikes on my shoes before – probably because I’ve never hiked on ice before. Sounds amazing and your pictures looked incredible. I’d love to go to Alaska someday and hike their glaciers. Hiking with crampons on ice takes a bit of getting used to, but I think it’s really fun! If you ever get the chance to try it, do it! I don’t think I could ever get sick of glacier hiking either, it’s too much fun! This glacier looks a lot bigger than Franz Joseph. Great photos! SO much fun. It’s actually not a whole lot bigger than Franz Josef (maybe like 2 km longer), but I think it’s wider and has more eye-catching shapes. FJ was WAY steeper, though! Definitely. The weather helped a lot! This glacier was certainly very photogenic! Glad you enjoyed checking them out. I’m sure your Denali adventure was just as awesome, Margo! And yes, it’s great how accessible this glacier is as compared to some others around the world. What stunning photos! The fourth one is my favorite because there is a bit of reflection in the water, and the person gives it scale. Trekking on Perito Moreno in southern Argentina was one of the highlights of my travels, and I would definitely trek this one too. I would LOVE to trek Perito Moreno! I’ve seen photos of that (including yours), and it looks AMAZING. We were so excited to see a glacier for the first time in Chilean Patagonia a couple of months back… Can only imagine to actually hiking on it! Thanks, Zara! If you ever get the chance to hike on a glacier, definitely do it! This looks awesome – what a cool experience. Love those spiky ice formations! Those spiky ice formations were SO COOL. I took way too many photos of them. How beautiful! Did a road trip around Alaska with my fam about 10 years ago, but we didn’t go hiking on a glacier. Only saw them. I’d love to do that one day. Alaska is such a pretty place. I’d love to see more of it eventually! Road tripping up there sounds really fun. Amazing! We hiked Iceland’s Sólheimajökull glacier in January and I have to say I agree with you about the awesomeness of glacier hiking. There’s just something about that icy crunch! Adding Alaska to my must-do list—along with New Zealand. Awesome! I didn’t do glacier hiking in Iceland – but I considered it! It’s so much fun. And every glacier is so different, that I feel like no hike could ever feel similar. It is almost impossible to pick a favorite photo. The day was so clear and the clouds were perfect. You were obviously blessed with incredible weather (and the clouds are gorgeous). Do you have any idea how typical those conditions are for the summer season in that area? Also, I note you mentioned that the glacier is on private land. How cool would it be to own property with a glacier on it? WOW. Finally, did you receive the private message I sent to your blog’s Facebook page the other day? And yes, we were very lucky with the weather! I’m not really sure how typical days like that one are in the summer, but I know it was quite rainy in Anchorage in the days before and after this one. So we definitely caught a good one! We had such a fantastic time. I would definitely love to do it again! To answer your question – your post makes me wanna jump out of my flat, into a plane and onto the nearest glacier I can find! Seeing a glacier up-close had been on my Bucket’s List for a long time, before I finally set foot on the Icelandic Snæfellsjökull last August, followed by a “proper” hike on Vatnajökull. However, I want more! And seeing how trekking out in the wild in Alaska is one of the other BL points, it seems perfect to combine the two and let myself be inspired by your experience. Next time I’m in Iceland (because I’m convinced there WILL be a next time! ), I’ll definitely have to do a glacier hike there, too! So, so beautiful! My dream trip is to circumnavigate the globe north of 60 – pictures like these only add to the attraction. Wow, that sounds like an amazing dream trip! No doubt you’d see lots of scenes like these. I too have hiked down in NZ (Fox) and when I was in Alaska, another girl in my group had done Franz, so she was skeptical about hiking again in Alaska. I went on the first day we were in Wrangell–St. Elias and hiked the Root Glacier and when I got back to camp, I told her, “No, if you haven’t hiked one glacier, you haven’t hiked them all”. It’s so true! I skipped hiking a glacier in Iceland because I’d already done it in New Zealand. But I don’t think I’ll ever pass up the opportunity again – I loved it just as much (if not more!) the second time around! Your photos are beautiful and we love the sounds effects of hiking with crampons too! Looks like a wonderful summer adventure, but would you ever consider giving Alaska a try in the winter? I’ve been to Iceland, Norway, and Canada in the winter, so why not Alaska?? Palmer is a must adventure to do while in Alaska, we get a helicopter to the top of a glacier and had a nice time there.